The main conference on Social Network Analysis was is in San Diego this year, so I decided to make a trip down. Was nice to step away from the screen and see old and new faces from the far-flung research community. Amusingly, the conference landed in the middle of spring break celebrations, so there were bearded academics wandering geekily around in crowds of drunken sunburnt 20-something revelers. 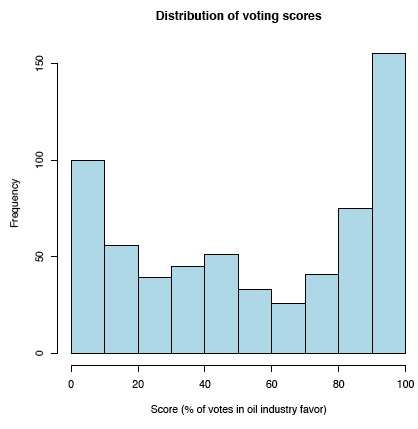 I gave a presentation at the very tail end of the conference to demonstrate some features of the oilmoney website—including a presidential contribution movie, and bit of analysis on the data. Much of this will be familiar to anyone who has read these earlier posts, but the stat stuff is new. The following is an adapted and expanded version of the presentation I gave at Sunbelt XXIX on March 15, 2009 Thanks to co-developer Greg Michalec, Steve Kretzmann and Trina Zahller at Oil Change International. The development and data assembly (but not the analysis) of this project was funded by Oil Change. There is a surge of work going on in the tech / non-profit / “transparency” sector to get government data released in useful electronic forms. Much of this data is sociologically relevant and could become a resource for researchers (many of whom are already curating related datasets) especially in the political science domain. I think the technology behind this project could be very useful for researchers attempting to present and communicate relational data via the web. One of the things I enjoy about my hybrid role as a independent developer / researcher is the opportunity and necessity of doing relatively practical applied projects to pay the bills. This project was a collaboration supported by Oil Change International, a 501c3 / 501c4 (Oil Change USA) organization campaigning to facilitate a transition to clean energy. 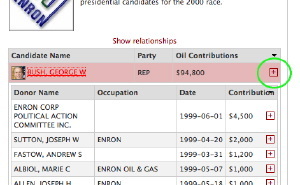 The raw data from the FEC includes all kinds of transactions for all Federal candidates, including loans, independent expenditures, etc. They are very complex to parse and work with, so the CRP does some normalization and categorization of contributions into industry sectors. We used all of their information for the Oil & Gas sectors, and matched it up with the other data. When sum up all the contributions by company, we can clearly pick out the major contributors. 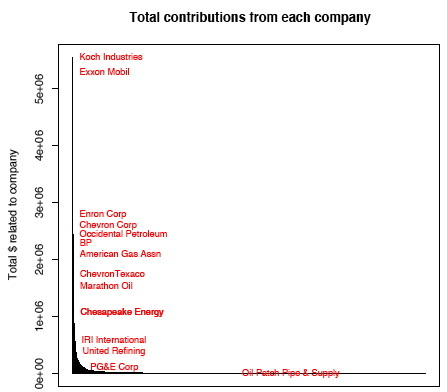 But remember, Oil is < 3% of total contributions to candidates! The process of constructing the networks from the rows of data is quite complex. The basic concept is that we are creating directed relationships from “company” nodes to “candidate” nodes, using information from the candidate’s filings. In some cases the contribution comes from the company’s PAC, but we also count contributions from individuals when the individual is employed by the company. Which ties should we count? 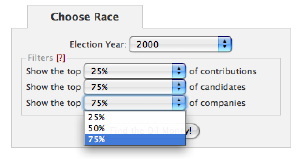 Contributions come in many sizes, should a $250 (the minimum reporting threshold) contribution from Joe Pipefitter be counted as much as $4600 (the maximum individual contribution to a presidential race) from a company CEO? or a $25,000 contribution from a company PAC? 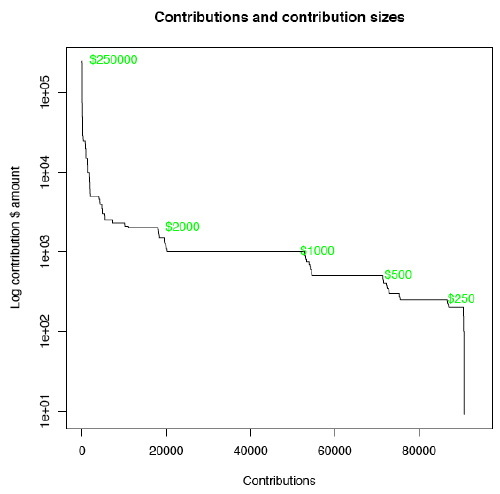 This plot shows all the contributions along the x axis, with the the amounts (compressed) on the y axis. The stair steps show where there lots of contributions of the same size. Although in most of the plots we’ve been lumping together contributions from several election cycles, the contributions actually vary a lot–from a gusher to a slow seep. This plot shows how much money arrives each day. 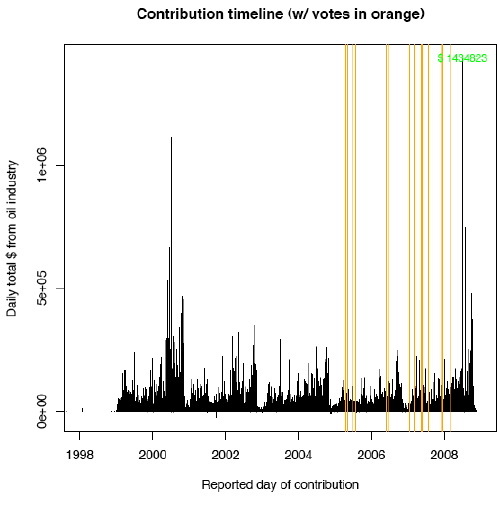 The orange vertical lines show the time points where we have voting data (discussed later). 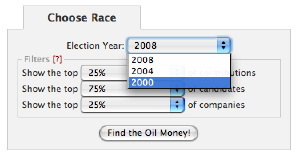 Periodicity from election cycles, filing deadlines, and weekly cycles. Coincidentally, we happen to have some software that makes it possible to look at how the relationships unfold in time by animating across a series of “slices” of the networks at subsequent time steps. 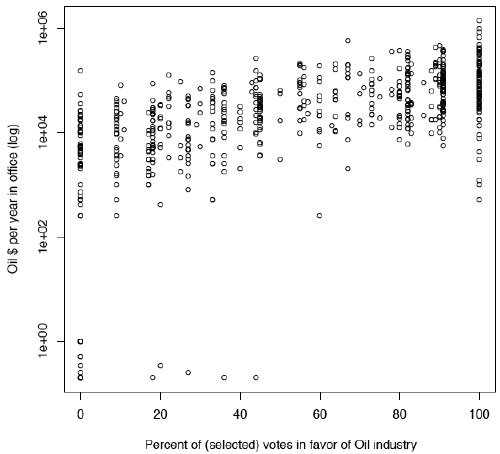 So although I’m not gonna try to establish causality, the goal is to see if there is some kind of correlation between the amount of oil money a politician gets and their behavior towards the industry. In order to test for a relationship, we need some way of measuring a politicians alignment or support of the oil industry. For incumbent congressmen, we can do this indirectly by checking their positions on a set of relevant roll call votes. However, the actual intent of a bill can be difficult to decipher (riders, amendments) and the accuracy of the measure is of course completely dependent on which bills are selected to be in the vote “basket”. There are many possible explanations for this trend. 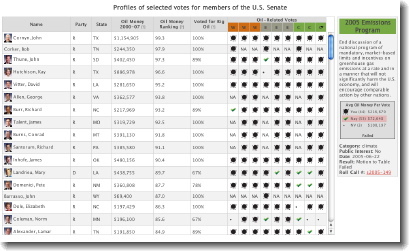 Perhaps companies tend to give to their state’s representation, and the congressmen from oil-producing states happen to be Republican? 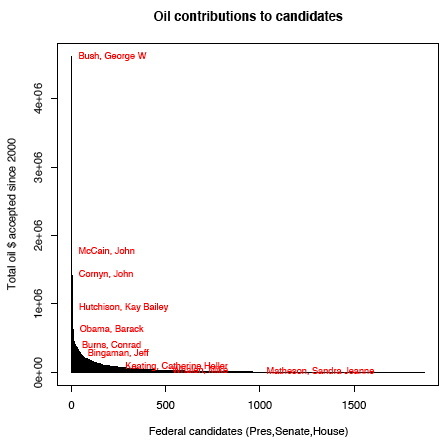 Or maybe it has nothing to do with oil money at all, and it is just that oil-supporting candidates get more money overall, some of which happens to be from oil companies? Or maybe maybe the more “conservative” members have just been in office longer and had more time to stack up campaign funds? As most people visiting the website don’t have scientific backgrounds, we can’t assume that they will understand a regression analysis (I barely do myself). So the choice was to display much of the same information in an interactive table. Also, as Oil Change International is non-profit, they were understandably cautious about presenting informtion that might make it appear that they were endorsing any candidates. They felt it was much better to present the data so that people could explore it and draw their own conclusions. Wait, what about network analysis? Ok, you got me. I didn’t actually do any network analysis in this project. Yet. But I do have a few qualitative observations and things I’d like to look at. Core/fringe structure? (but it just because it is bi-partite…)? 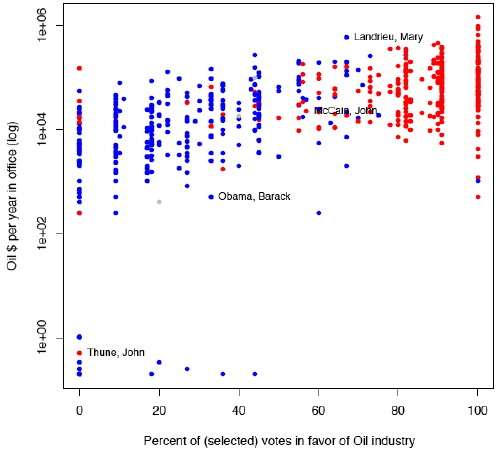 Net of party and voting, what predicts tie formation? 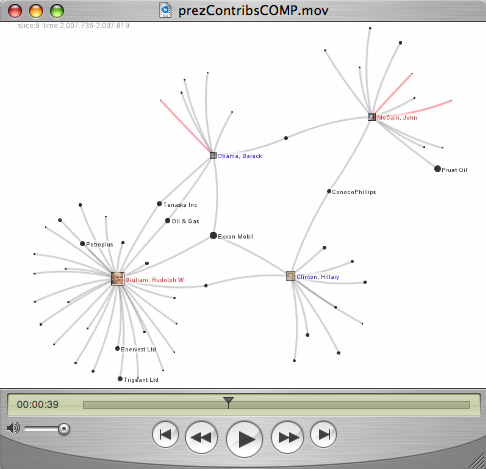 Are regional / state interests more powerful events once “broad” donors are removed from the network? 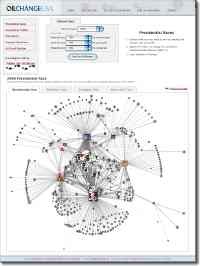 Explore time lags of network influence? But did anybody learn anything? We were able to get the technology working well, and in a fairly cross-browser way. We got positive feedback (especially from the design community), but also saw situations where or design did not communicate effectively at all. So was it worth all the work to present network data on the web? Package up software for open source release. We are gonna release source, but if we could find funds to make the code more general, and to write documentation it would be much more useful. Define a format so people can publish networks as “self contained” web apps. This would probably have to be a funded project, but not a big one. Are there researchers with stats and polisci backgrounds interested in working with this data? 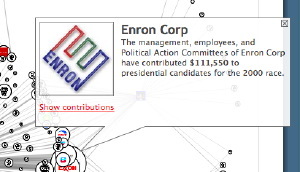 Previous PostDigging into MAPLight.org’s Bill Endorsement DataNext PostCorpWatch API lauch!